Spacemaile Hanging Screens give you the ability to create functional separation while maintaining transparency and airflow. 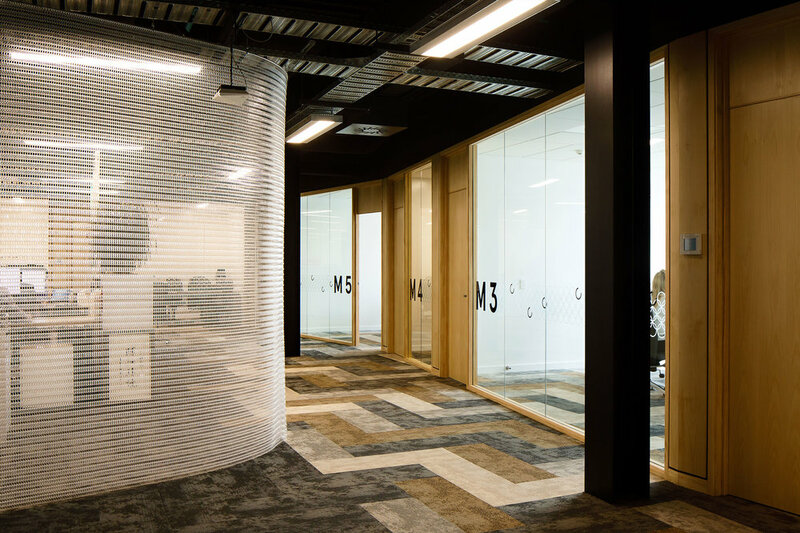 A simple ceiling-hung solution, made from Kaynemaile’s polycarbonate architectural mesh, Spacemaile Hanging Screens can be made to any size without distracting gaps or seams. Available in a range of 14 standard colours, there is a beautiful Spacemaile solution for any project. Custom shapes: We can make curved screens. Contact Kaynemaile to discuss your requirements. Hanging system: 12.7mm (½”) diameter stainless steel hanging tube and our proprietary stainless steel ceiling hooks. Spacing of hooks is typically 600mm (23-½”). Supplied hardware: Interior Hanging Screens are supplied with Kaynemaile mesh and all hanging hardware you need for installation. Our systems are simple—screw the supplied hooks into your ceiling substrate and hook the hanging tube over the hooks. Large screens are supplied with lifting cord to help you install. Let us know what your ceiling substrate is and we will supply the correct screws. 12.7mm (½”) stainless steel hanging tube, with proprietary stainless steel hooks at 600mm (23-½”) approximate centres. Standard screen fixings are available for timber, steel and masonry. To order for a new construction project just let us know the specified width, height and colour. We can supply your screens slightly oversize in height to allow for any ceiling height variations during the construction period. Hanging screens can easily be trimmed down in height once on site to suit the actual built space. The installed height for the screens should sit just above the finished floor level. To order for an existing space just let us know your required width and the actual floor to ceiling dimensions of your space. We will make allowance for our fixtures in the finished height.